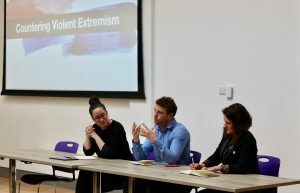 On 20 March 2019, VOX-Pol and the Security Distillery hosted a symposium in Dublin City University titled ‘Extremism: Online Networks and Offline Violence’. The Security Distillery is an initiative from young researchers for (young) researchers, with the aim of turning complex issues into simple matters in order to provide quality, accessible information for students and researchers. It is comprised of students from the International Master in Security, Intelligence and Strategic Studies (IMSISS), a two-year Erasmus Mundus Joint Master Degree (EMJMD) awarded collectively by the University of Glasgow (UK), Dublin City University (Ireland), and Charles University in Prague (Czech Republic). 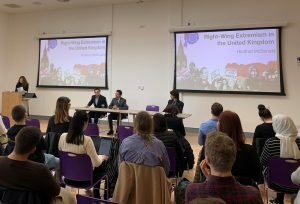 The first panel consisted of presentations by IMSISS students Javier Martínez Mendoza, Heather McDonald and Felipe Simoni on far-right extremism in Europe, the United Kingdom, and the United States, and was moderated by Casey Cannon. 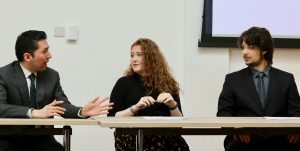 This was followed by an expert panel discussion on countering violent extremism by James Fitzgerald (IMSISS Programme Chair and Assistant Professor in Terrorism Studies, Dublin City University), Maura Conway (VOX-Pol Programme Coordinator and Professor of International Security, DCU), and Orla Lehane (Education Director, Fighting Words, DCU). The presentations and a full discussion will be available shortly on the Security Distillery’s website.